Nearly 150 guns and rifles seized by Santa Clarita Valley Sheriff's Station deputies after a barricade in Newhall on Wednesday, Dec. 6 2017. NEWHALL, SANTA CLARITA (KABC) -- An hourslong barricade involving a domestic assault suspect in Newhall led to the discovery of 144 firearms in his home, Los Angeles County sheriff's officials said. It all started Wednesday at 7:45 a.m., when Santa Clarita Valley Sheriff's Station deputies responded to the 25200 block of De Wolfe Road regarding a man with a gun and domestic disturbance call. Deputies spoke with two victims who told them the suspect, identified as Robert Mount, had pointed a handgun at them and threatened them. The incident apparently stemmed from an unreported spousal assault from the night before. The victims said Mount had several firearms at the location and was still inside the house when authorities arrived. Deputies surrounded the home and made several attempts to communicate with Mount, but he didn't respond. The Sheriff's Department Crisis Negotiation Team and SWAT officers soon responded to assist in the barricade. Meantime, nearby residents were evacuated while detectives secured a search warrant. Mount eventually surrendered with the help of crisis negotiators at about 2 p.m., and detectives searched the residence. 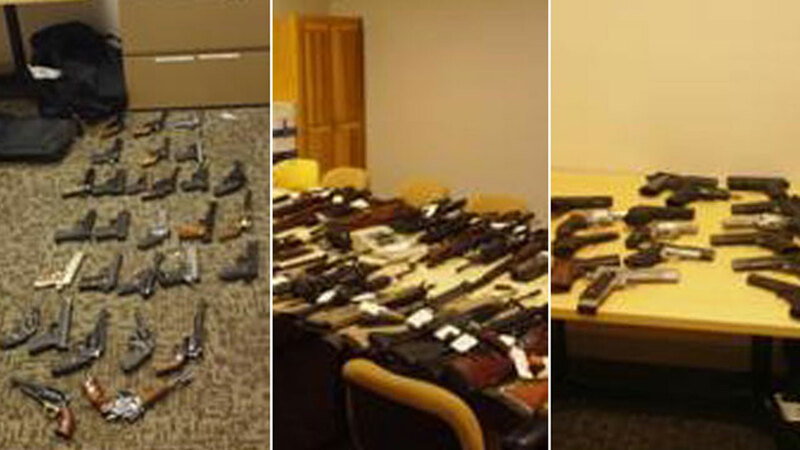 During the search, deputies found 144 firearms, consisting of rifles and handguns, officials said. Detectives and firearm experts were examining the weapons. Officials said it is anticipated that several rifles will be identified as being in violation of California firearms laws. Mount was in custody on charges of spousal assault, assault with a deadly weapon and weapons laws violations. His bail was set at $175,000. Anyone with more information about the incident was encouraged to contact the Santa Clarita Valley Sheriff's Station at (661) 255-1121.